Hina Jilani addresses the OECD Roundtable on Equal Access to Justice in Lisbon, Portugal in March 2019. 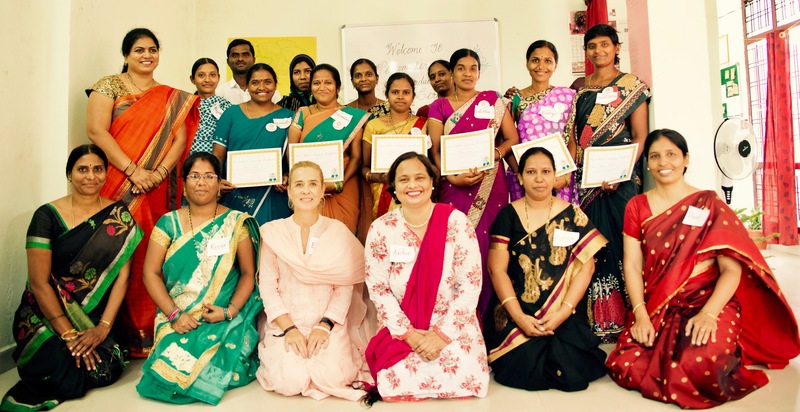 The global injustice of violence against women is estimated to cost between 1 and 4% of GDP. Hina Jilani considers the business case for access to justice. Read her keynote address to the OECD Global Policy Roundtable on Equal Access to Justice in Lisbon, Portugal on 27-28 March. It is a pleasure and a privilege to be with you here today at the start of this important roundtable on equal access to justice. I wish to thank and congratulate the OECD and the Government of Portugal for convening such an impressive array of speakers and delegates, and for structuring the discussions so we will have a chance to focus on high-level political questions but also the role of innovation, technology and people-centred approaches. All of these are essential components if OECD states and the wider international community are to meet their commitments under the Sustainable Development Goals to deliver access to justice for all by 2030. The challenges are undoubtedly stark. According to the emerging findings of the Global Taskforce on Justice report, more than 5 billion people do not have meaningful access to justice in the world today. At least 244 million people live in extreme conditions of injustice, meaning they are modern slaves, stateless, or their countries or communities are riddled with conflict, violence and lawlessness. The burden of injustice falls all too heavily on women, children and other vulnerable groups who face the hardest struggle to access the justice system and exercise their rights. The justice gap is both a reflection of structural inequalities and disparities in power, and a contributor to these inequalities. I have been a fighter for justice my whole life: justice for women, for victims of abuse, persecution and political oppression, for poor, vulnerable and marginalised communities, and for brave human rights defenders. Very often of course, all these categories can apply to one individual person who finds her- or himself legally and politically restrained by an interlinked web of institutions, belief systems and economic structures. Every individual is equal in the eyes of the law. But for this to be more than a truism more honoured in the breach, the law needs to operate in the interests of each individual. Lawyers, courts and the wider legal infrastructure of states need to recognise individuals’ specific economic, social and political circumstances, and operate with respect and flexibility to build consensus behind the rule of law in the general population. For me, this is a matter of fundamental human rights. States have a duty to ensure that this right is available to all within their jurisdictions, on the basis of equality and without any discrimination. This is why I believe it is essential to develop a people-centred approach to delivering access to justice. And this is what I have sought to do throughout my career: as an advocate in Pakistan, as a special rapporteur for the United Nations, as a member of the Global Taskforce for Justice, and as a member of The Elders, the group of independent global leaders founded by Nelson Mandela who work for peace, justice and human rights. 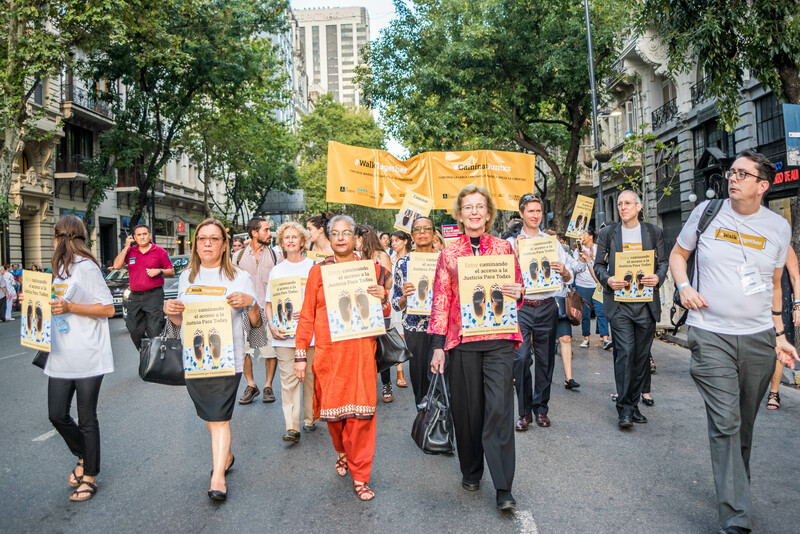 Last year, I went with Mary Robinson – now the Chair of The Elders – to visit innovative grassroots justice projects in Buenos Aires, Argentina. It was deeply inspiring to see the commitment and resourcefulness of these activists, and the impact their emancipatory efforts were having in their communities. Without their determination and sacrifice, the lofty goals we will talk about here stand no chance of ever being realised. 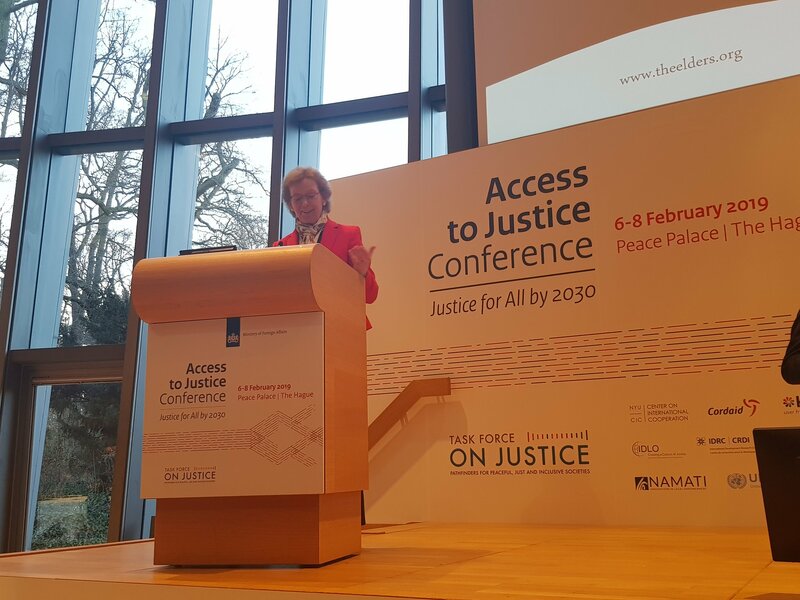 The Elders believe it is critically important for the global debate on access to justice to be heard beyond the echo-chamber of the like-minded within the legal community, and to engage with governments, economic stakeholders and broad civil society. In short, we need to make the business case for access to justice. As the new OECD report spells out, the inability to access justice can be both a result and a cause of disadvantage and poverty. Unmet justice needs can lead to social, physical and mental health problems, lost productivity, and reduced access to economic opportunity, education, and employment. This applies to all people at all levels of society, but the issue is particularly acute for women who in many countries suffer from structural discrimination and a lack of empowerment even when a specific legal system, on its own terms, operates effectively. Nowhere is this more starkly or vividly illustrated than in regards to violence against women and girls. This is a matter that must be urgently addressed as a profound global injustice by political, traditional and religious leaders, and also by business leaders, finance ministries and all who share an interest in sustainable and just economic development. Violence against women is estimated to cost between 1 and 4 percent of GDP. The financial costs to private businesses have been found to be as high as 3.7 percent of GDP in Peru and 6.5 percent of GDP in Bolivia. In the United States alone, the cost of intimate partner violence exceeds $8.3 billion per year. The cost is far greater than dollars, euros or yen, of course. The psychological damage is incalculable, as is the cultural cost to today’s communities and subsequent generations of living in a society where violence, misogyny and discrimination is normalised. But while the challenge is daunting, we cannot succumb to fatalism or hide behind the excuse of “cultural sensitivities” to avoid taking the necessary action to right this wrong. 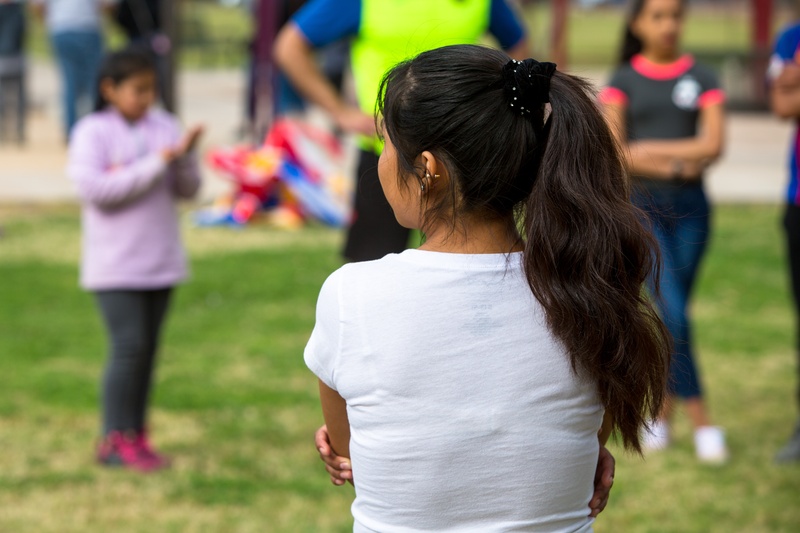 By improving access to justice and introducing and enforcing legislation that prohibits violence and discrimination, governments in all OECD countries have a real chance of improving women’s economic position and reducing violence. These improvements are necessary, they are urgent and most importantly they are deliverable – but only if states in the OECD and partner countries both increase their financing and investing in access to justice, and embrace more innovative techniques to do so. This should include not only formal processes or institutions but also how the informal justice system, technology and paralegals can be used in ways that strengthen the overall architecture of justice and support for the rule of law. Indonesia offers one such example: in 2011, it adopted a national legal aid law that not only recognises the critical role of paralegals and legal aid offices, but also provides public funding to strengthen organisational capacity and coverage for these offices across the country. At all levels, investment in access to justice should be evidence-based, people-centred and innovation-driven. Such an approach is consistent with the wider vision of the UN Sustainable Development Goals, which offer both indicators and frameworks for measuring and implementing progress, and for holding leaders accountable to their responsibilities and obligations. I believe that the SDGs represent one of the great achievements of multilateral diplomacy in recent years. Together with the Paris Agreement on climate change, signed in the same year, they offer a clear pathway to progress, with clearly defined responsibilities and benchmarks by which to measure states’ progress towards implementation. In today’s troubled and turbulent times, when the forces of populism, isolationism and unilateralism are on the rise, it is vital that all of us who believe in the importance of multilateral institutions like the UN and OECD stand firm in their defence. We know from today’s geopolitical landscape, and we know from the lessons of history, that populism, isolationism and unilateralism are invariably the handmaidens of injustice. When politics is driven by cynical self-interest; when classes, communities and nations are set against each other so the interests of the powerful go unchallenged; and when discrimination against women and minority groups is excused in the name of cultural tradition, this constitutes an assault on justice. Forty-five years ago, the citizens of Portugal came together to overthrow a cruel dictatorship, paving the way for the robust democracy we see today where the rule of law is respected and innovative techniques are developed to ensure all citizens have access to its services. We should draw on that same spirit of determination, courage and commitment today to make 2019 the year that justice for all is truly delivered for all the world’s people.